When you need a vacation but don’t have two weeks or the necessary finances to fund a trip, try setting aside some time to relax with your favorite scents. Scents can make you think of different times and places, and you can go there deliberately. Spending a few hours in a vacation-inspired atmosphere can leave you feeling rejuvenated. Do you enjoy the crisp mountain air or the fresh, clean scent of the air after a rainstorm? Get out of the office, put some Mountain Air or Rainstorm reed diffuser oil in your diffuser and let these scents take you outside. Spend a few minutes enjoying the scent by relaxing in a room with a view, lounging on an enclosed patio or watching the National Geographic channel to experience a mini wilderness getaway in your own home.. The scent of Garden Mint or Cucumber Mint allows you to power up as you relax with the cool, crisp smells of the garden and the stimulating properties of mint. For a special treat, make yourself a mojito, slip some minty reeds into your diffuser and let the scent of a summer garden envelope you as you enjoy your beverage. Escape from a dull and grey winter day into an exotic locale with the help of a tropical or beach scent. Although the scent of Caribbean Coconut or Pacific Coast might at first seem out of touch with your surroundings, try adding other sensory experiences to help take you away. Watch a movie filmed in an exotic location as you drift away with Caribbean Coconut, or close your eyes and listen to the pounding surf on a CD of ocean sounds as you take in the smell of the shore with Pacific Coast. Slip some reeds into your diffuser as you hunker down with a good book and let scent help you escape into another world. Try selecting the scent according to genre. For example, the romantic smell of Fresh Cut Roses or Jasmine Vanilla perfectly complements romance novel reading, whereas the warm tones of Sunset can accompany you on a ride into the typical sunset of a western. Take a little time to breathe deep, enjoy the little things and step out of everyday reality. When you need a break but can’t take a vacation, let scent take you on a mini vacation that will leave you relaxed and rejuvenated. The Diffusery has been featured in Better Homes and Gardens May Gift Guide ! Check out page 99 of the May 2010 issue under “Gifts For Grads” to see our green ball glass reed diffuser bottle and reed diffuser reeds. We were so happy when we received word that we would be featured. Our first feature in a national magazine ! We were very excited and went out very early to get the new issue that went on sale today. Only our grocery store still had the April issue out. Darn. My mom searched a few stores in Milwaukee. They all had the April issue out still. My husband had to run to the grocery store this evening to get some soda. Guess what ???? 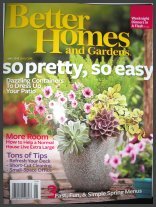 There she sat in all her glory…the MAY 2010 issue of Better Homes and Gardens ! When he brought it home you would think we just won the lottery. We turned the pages one by one in great anticipation. Finally we spotted it ! Page 99…right on top (#1 in fact !) was our mention. Many a hi-five was exchanged and tonight I go to bed feeling like a celebrity. Sort of. Thank you Better Homes and Gardens for the feature. If you have written about us in your blog, please drop us a line. We are creating a new “Press” section soon and would love to include you ! It’s a great way to get an extra backlink too ! Will Santa Make It In Time ? Friday (the 18th) was the last day we could guarantee that packages would arrive to you (or your recipient) via priority mail before Christmas. If you would still like to order with an expedited shipping method such as express (overnight) mail, or UPS next day or second day air, please contact us and we will get you a quote ASAP.